How millennials are changing consumption story of India? Sharma speaking at the sidelines of FICCI Massmerize 2018 recently concluded in the capital city New Delhi. According to Sharma when it comes to food, millennial population is less competent as their earlier generation used to be. Also, they want to spend less time in kitchen. Thus, it offers an unique opportunity to food marketers to reap the benefits. “Being operation 28 years in food industry, I always been craving for consumers say to I want convenience. So far, convenience was the bad word for the food industry. This emerging trend of convenience products is going to redefining trend how food is going to consumed in the time to come,” said Sharma. Historically, brands used to be aspirational in nature. Earlier, it was pre conceived notion that consuming certain brands reflect the personality of the consumers. As per Sanjay, now, it is incrementally becoming other way around, now millennials are more into value system. “They are more into saying this is my value system, does your brand hold the same value. Relating to brand is paramount factor to younger people,” he said. People today are far more aware about environmental effect, in the past was more theoretical in nature, thus, it did not impact us. Younger generation is concerned about the pollution, water problem and other environment issues. They are more aware about the consequences and want to live responsibly. Therefore, they want to be associated with the brands which demonstrate responsibility to sustainability. Citing the product innovation within MTR informed that MTR is into south Indian breakfast category since a very long time. 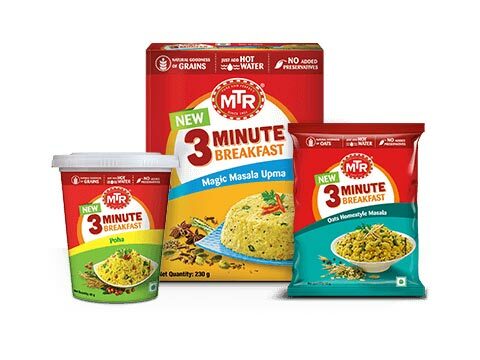 Now, the company has introduced 3 minutes range which is catered to the needs of the millennials. Going further he adds that MTR is working towards creating Amazon Alexa friendly recipes because this where future lies. “This is idea which is going to populate. You may not get personalized products buy you need to personalize the experience,” he said.